I spend a lot of time reading, so I can't let the last week of the year go by without talking about what books pushed my buttons this year. Jana and I love discussing books with you all on the second Tuesday of each month for Show Us Your Books, and this best of 2015 extra seemed to make sense. 1. You by Caroline Kepnes (January) - If a book contains a psycho, chances are I'll like it. If it contains a psycho that the author manages to make likable, I will love it. That is this book, and its follow up that I read in December. 2. The Martian by Andy Weir (March) - If you would have told me that a book that has a lot of science and math in it would be in my top 10, I would've told you to GFY. But it's here and it's true - the techy stuff did not prohibit me from enjoying this book. Mark Watney is one of the most likable narrators I've come across. Impossible to root against him. 3. The Short and Tragic Life of Robert Peace by Jeff Hobbs (March) - Sometimes a book resides in my top 10 not because it was well written or because it was a feel good story, but because it made me think or because it upset my balance in a way I needed it upset. 4. The Storied Life of A.J. Fikry by Gabrielle Zevin (April) - I love books about reading, and while this is about other things, it's largely about the powerful impact reading can have on our lives. 5. The Sea of Tranquility by Katja Millay (May) - Beautiful writing, well shaped characters, and the intensity of the emotions of youth combine for a riveting read. I stayed up late to finish this one, crying a lot at the end. 6. 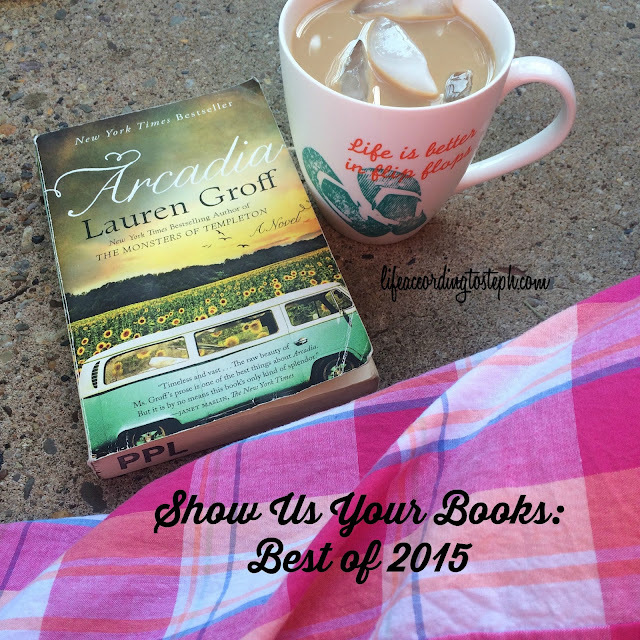 Arcadia by Lauren Groff (May) - I do love me a cult book. Combine that with good writing and well developed characters and you've got me. 7. The Wayward Pines Trilogy (June) - Sometimes a book makes my top 10 because I absolutely devoured it - that was true of all three books in the Pines trilogy. I wish I had more to read from Blake Crouch. 8. Take Me With You by Catherine Ryan Hyde (June) - This book pinged a lot of my points - a road trip to Yellowstone, sobriety, dog love, choosing your family. Sometimes it feels like you come across a book at a perfect time, and this was one of those books for me. 9. Kane and Abel by Jeffrey Archer (September) - Good old fashioned mass market paperback writing on scheming and dynasties. 10. Some Girls Are by Courtney Summers (October) - A punch in the gut, it should be required reading for all parents and kids. I cannot wait to see what you chose as your favorite reads of 2015. Non-bloggers, please comment with yours! Out of all the books you've listed, I'm unfamiliar with Arcadia. Of course, going to check that out. Someday I may get back to reading fiction. Nice that I will have your reviews to look back on. Right now I don't need something to punch me in th gut or make me cry. I did enjoy Gone Girl, so I probably would read something like that. Sea of Tranquility - I read that last year - I want to re-read it now. You and Wayward Pines are going on my list. Wayward Pines has got me intrigued. I did get stuck on the technical stuff in The Martian, but I enjoyed it at the same time, because he had such a freaking great sense of humor. I think the book was even funnier than the movie. Adding a few of these to my list! "You" has been on my TBR list for months but I couldn't find it so I kept putting it off. Soon! And I agree about The Martian. I haven't read the book (it's sitting on our shelf because I bought it for Scott for his birthday) because space freaks me out, but the movie was fantastic. Wayward Pines is on my book list for Erin's reading Challenge, I'm going to start it 1/1 and I cannot wait! out of your list I only read the martian and sea of tranquility. But oh so good! I need to link up - even if I'm late! I read 4 of your 10 and agree wholeheartedly about each. Robert Peace remains in my heart and I think of him often, especially on my MANY trips to Newark. I have to say that The Rosie Effect was a HUGE favorite this year. Still Alice moved me. My nemesis book of the year has to be Sophie's Choice... it has lingered for MONTHS, and has challenged my vocabulary to the max. I thought myself to be erudite... not so much! I want to read The Martian, but if I am not senile when I finish Sophie's Choice, I will try it out. I only read The Martian out of this list bu I loved it! It's on my list as well. Thanks Lauren! I will check her out. I enjoyed The Arsonist (read last year, maybe?) and Eight Hundred Grapes (read earlier this month). I appreciate you sharing some of your favorites! I'm glad you've found some good ones via the link up. i've read a few of your favourites, the others are on my list. just got some girls are so i'm excited for that! I think that I'm the only one that didn't love The Martian! I wanted Mark Watney to get off Mars, I just couldn't get past the science and math. I should have listened to it instead of reading it. Everybody keeps on talking about The Sea of Tranquility, The Storied Life of AJ Fikry, Some Girls Are, and You, so obviously they need to be on my TBR list for next year. I didn't give The Martian 5 stars because of all the math and science that I had to skim over....otherwise, liked it a lot! I've added The Short and Tragic Life to my list and aaagh! How did I forger The Sea of Tranquility on my list?!!! I need to go and edit it ASAP! Loved that one! The Sea of Tranquility was my favorite book I read this year...a recommendation from you, which I obviously really appreciated! I typically love books about psychos, but "You" just didn't work for me, maybe because I HATED that girl so much? Who knows. Love y'all's monthly book linkup so much! Not even kidding, when I read the first few books on your list, I thought I had somehow stumbled onto my own post from earlier in the year because all the same books. Somehow that's not surprising, though. Wayward Pines is on my list for Erin's challenge, and I think some of the others are already on my TBR. Of course they are. I see 105 books and my jaw hits the floor. I think I read 6? haha I'm terrible. Still I'm getting better because 4 of those were this month. I'm adding several of these to the list as well. I have to admit I'm loving this "best of" so that it really gives the best of the best for us who read far fewer books! Maybe I will actually start really reading again this year like I used to. More than cook books, self help single moms who choose horrible relationships books and Real Simple magazine. I just started Dumplin' tho so I am on my way!!! Wow, you are super impressive!!! This is amazing. I've only ever heard amazing things about "The Martian" and my BIL read it all throughout Paris and was always cracking-up. So I really need to get in on that. I'm adding some of these to my list! This year, the best book I read was The Last Days of Ptolemy Grey. Every year, New Castle County does "NCC Reads," where they invite everyone in the county to read the same book and order tons of copies for the libraries. Then they have the author come and speak for free, and anyone can go. I read the book every year, even if it's not at the top of my list, and then I go see the author. I read this book in April as a part of that, and I loved it. I highly recommend it. Philly participates in a similar program Laura! I'll check out The Last Days of Ptolemy Grey! I am *patiently* waiting for Hidden Bodies to come out in audio format since I am pretty much a straight up audiobook gal these days given my 1.5-2 hour daily roundtrip commute. What did you think of it? I put my list at the end of the next Show Us Your Books (because I was lazy and have clearly missed the boat) and You was on it. And I have pretty much added all of your other favorites. Now off to go read everyone else's list! The Sea of Tranquility made my list as well, and You was an honorable mention. The majority of your other picks are on my "To Read" list, so who knows? Maybe some of them will pop up on my "Best Of" list for 2016. Also, 104 books? That's amazing! I'm always in awe when I see book totals in the 100s for a single year. I can only dream of a day when I'll be able to read quickly enough to get through that many! So sad I missed posted but #1, 4 and 5 would have made my list too. I made a goal of 100 books for next year which is a stretch but manageable too. Fall goals - how did I do?